Are you at ease walking into a room full of strangers? Professional networking is a key door opener to new possibilities and new opportunities, both personal and professional. Yet many of us find the process daunting and difficult – and if we find something difficult, we tend to avoid it! Where so many of us fall down is on the ‘how’. Research shows that building a supportive network plays a vital role in career progression, business development, team building, entrepreneurial success, and general business leadership. It also shows that the skills needed to network effectively are also skills which can be codified, taught and put into practice with immediate effect – and that’s where this workshop can help. We offer a bespoke workshop which focuses on the job search. Responding to job ads, talking to recruiters and writing ‘on spec’ are all necessary but not sufficient elements of the jobseeker’s toolkit. In today’s challenging job market, students need to know how to be visible, memorable and stay ‘front of mind’ with decision makers. In other words, they need to know how to network effectively. We also offer a workshop tailored to meet the needs of alumni relations departments, keen to both encourage alumni to stay in touch and equip them with the skills to do so. A smattering of theory provides a solid foundation for what we actually do. So the workshop introduces key concepts in current network theory. 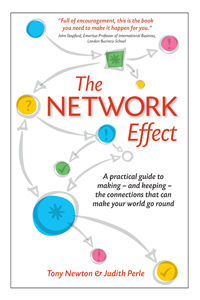 Research shows that everyone can become a confident networker – all it takes is the right approach and plenty of practice. So the emphasis is on ‘learning by doing’. There is ample opportunity for ‘role play’ to try out new techniques and approaches in a safe, supportive environment, and to discuss and resolve any specific issues participants may face when creating and getting the best from networking opportunities. Networking for long-term benefit involves more than social media – so although we touch on LinkedIn, Twitter and Facebook, the unashamed focus is on the actual process of meeting people and building relationships. Changing attitudes is key to success. So we strive to demonstrate that reaching out in order to build a supportive network is a sign of strength rather than weakness. The impending job hunt is very much on the mind of students, programme directors and careers advisors. Responding to job ads, talking to recruiters and writing to potential employers ‘on spec’ are all necessary elements of the jobseeker’s toolkit – but they aren’t sufficient in themselves. With research showing that up to 75% of jobs are never advertised, it is important in today’s challenging job market that students know how to be visible, memorable and stay ‘front of mind’ with decision makers. In other words, they need to know how to network effectively. Creative job hunting is about finding the right person to speak to; it’s about nurturing and maintaining relationships; it’s about making effective cold calls and follow up calls; it’s about meeting people and finding out what really makes them. And it’s about recognising that giving is often better than getting. Alumni are undoubtedly a crucial resource for any university, school or department. Yet helping them stay in touch both with the institution and with each other is no easy task. Providing databases, events, forums are all important…but possibly not sufficient, if your audience doesn’t really understand (a) the benefits to them of staying in touch and (b) how to actually do it.